Welcome to the Shags-Run Kennel & Farm website! 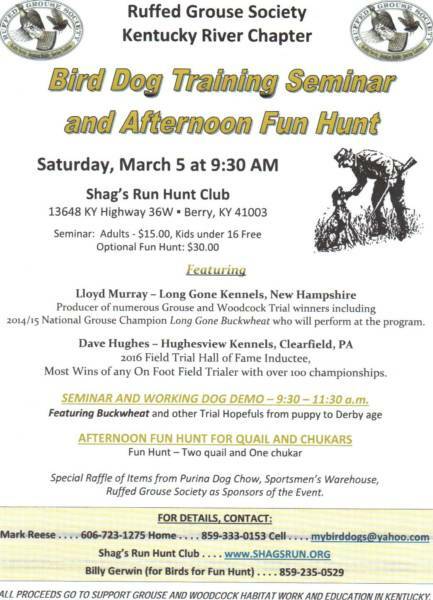 Here you can learn all about our dogs and our hunts. We have the best quail and pheasant hunting in central Kentucky with 6 upland courses. We offer self guided hunts, guided hunts, wagon hunts, corporate parties and group outings. Please look at the Hunts page for more information. Shags-Run is maintained and owned by Billy and DD Gerwin with their daughter Taggy. Please like us on Facebook for news, new photos, updates on our dogs, hunts and other events.